This recipe is just in time for the holidays and could not be easier. The dough goes together in the stand mixer (or bread machine) and only has to raise once. PARTIALLY bake the rolls (for about 10 minutes) then freeze them for later use. When it's time for dinner, pop them into the oven and finish baking them (no need to defrost). You'll know they are done when they turn golden. This technique insures great FRESH yeast rolls at ALL dinners. It is also a HUGE TIME SAVING RECIPE during busy holidays; it makes a dozen rolls. As "Empty Nesters" it is nice to be able to bake just two or three rolls. Mix 3/4 cup flour, yeast, sugar and salt in the bowl of your stand mixer. Heat the milk, water and butter in the microwave for about 30 seconds, or just until it is "baby bottle warm". Add it to the flour mixture and beat with mixer for 2 minutes. Add another 1/4 cup of flour and beat on high for another 2 minutes. Stir in enough of the remaining flour to make a soft dough. NOTE: This recipe calls for 2 cups flour (total), but it takes me 2+ 1/2 cups. Since the moisture content of flour is always different (brand to brand and climate to climate), I suggest that you put in the 2 original cups of flour and then see how the dough looks. If it's still very sticky, add a little more flour. Knead the dough (with dough hook or by hand) for about 8 minutes; at the end of 8 minutes, the dough should come away from the sides of the bowl cleanly. Cover with plastic and let it rest for 10 minutes. Divide dough into 12 pieces and shape into balls. Place in greased cupcake pans. Mist the top of the rolls with vegetable spray and cover loosely with plastic. Let rise until double (this dough rises very quickly and it only takes mine 30 minutes to rise). Bake at 375 for 16 to 20 minutes (if you are going to eat them right away)or until golden brown. If you are going to freeze them as Brown and Serve Rolls, only bake them half way; cool then freeze. 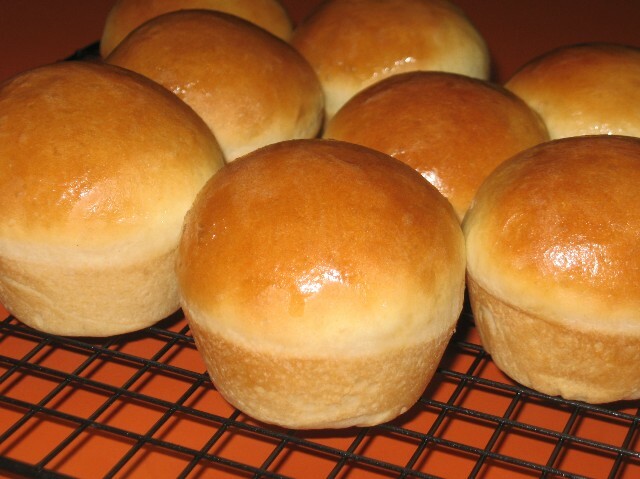 Just before you serve these rolls, and while they are still hot, brush with butter. I've made popovers before but never dinner rolls. I guess it is that yeast fear that I have. These do look so good though and seem simple enough to make! Beautiful rolls and they seem very easy. I never can make small batches of rolls. I always have to have about six dozen at a time. I'll have to try these. Thanks. I literally read this recipe, got up and started making it. Dough is rising as I type this!!! Can't wait!!! Thanks Coleen! i have made these twice now and they were a hit with everyone! only change i made was a pinch more salt and i just made the dough into balls and cooked them on a casserole dish, the edges would touch by the time they were done cooking, but they came apart easily and looked oh so pretty. :) one thing i might add, while these are good by themselves, you may want to serve them with something you can dip them in like gravy, or like i did, make mini turkey sandwiches on thanksgiving. they are a lot better that way. Coleen, My rolls just came out of the oven and they are absolutely the best dinner rolls I have ever made! I am going to make more to take to our Christmas dinner! Thank you so much for the recipe, although I used condensed milk (because that is what I had on hand). I used a little less than a half cup and a little more than a quarter cup of water to dilute the condensed milk a little. I also made large rolls in a big muffin tin, so the recipe made six super size dinner rolls. These were easier to make than most and this is going to be my go to recipe from now on! SOOO good! I just made these yesterday for dinner. It was my first time making homemade rolls using yeast and I have to say they were so easy and SO DELICIOUS!! I cooked what we needed and then cooked the rest part way as suggested and cooked them the rest of the way today to see how they were. Just as good as the day before. I will be making these from now on for holidays the day before and just cook them at last minute. Thanks so much for sharing such a yummy recipe :-).